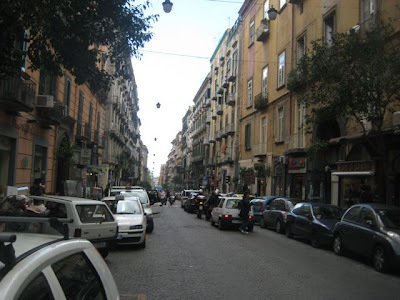 Naples is a city that is a pretty ugly, dirty, and chaotic on the outside. 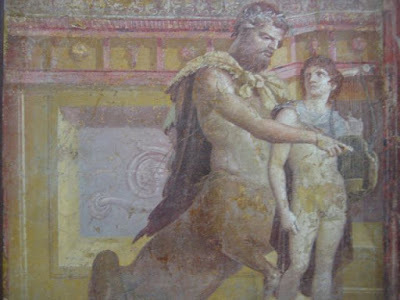 Hidden away on the inside, it is pretty, history-laden, and bursting with charm and flavor and art from the Renaissance to Roman times. It's a place where three 11-year old girls piled on a careening scooter will come close to taking your life, forcing you back onto a filth-strewn, construction-blocked sidewalk. The driver will give you a chirpy horn toot after the fact to remind you who is capo di tutti capi. 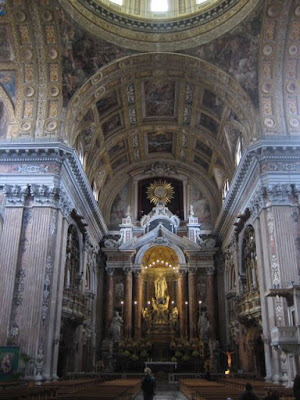 Naples is also where you will taste magnificently simple but wonderful food and see gorgeous church interiors. 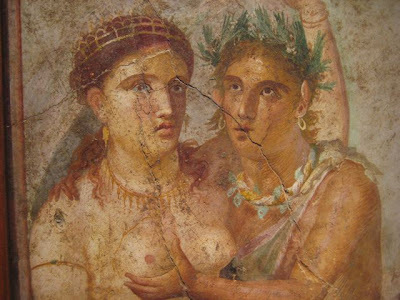 Basically, you go to Naples for something completely different. Which was what we wanted. Lucky for us, a Neapolitan native was on the plane and gave us a ton of good advice. I'll give you a brief rundown on the food. For pizza, we went to the famous Da Michele. 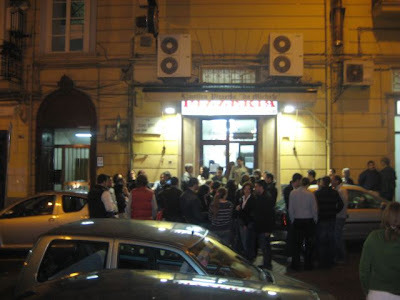 People line up for a table at all hours. 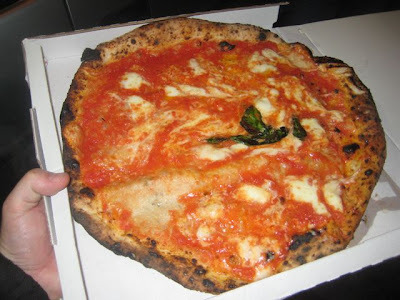 They only make two kinds -- margherita and marinara. I discovered the wait for a table at this modest-looking spot was quite long. You take a number and wait outside for it to be called. However, you can put a takeaway order in straight away and get it in about 10 minutes. We got ours and went to a pastry cafe across the street where they let us eat our pizza and order a few beers to go with it. After all the hype about this pie -- it was in our guide book and a magazine article, as well -- I thought it should be great. And it was. Simple genius. I searched for a way to describe the flavors and the word that came to my mind was "bright." The San Marzano tomato sauce really jumped out. The mozzarella, made from cow milk, not buffalo, had a clean, cream-like taste. The airy, almost fluffy crust had a char and smokiness picked up from about 90 seconds in the superhot oven. They say they've been doing it this way since 1870. And this great pizza cost just €4.50 (a little more when you factor in airfare and hotel). Not far away, just around the street from the Duomo, was another recommended place, which was our favorite. 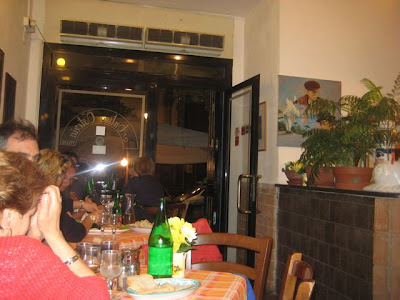 Antica Osteria Pisano di Ippolito Anna had only eight tables, an open kitchen, and a great, cheap home-style cooking. 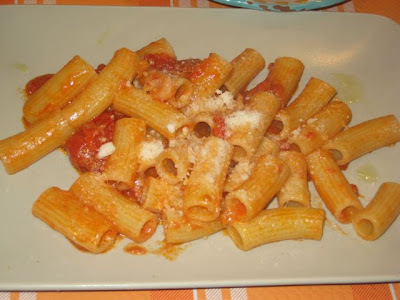 I had the rigatoni a l'amatriciana for €5. Just Parmesan, pork, and tomato sauce with fresh tomatoes, but it didn't need more. Their seafood pasta (I don't have a picture) was just terrific. The clams and mussels were the sweetest and freshest I can remember, and the pasta, which had absorbed the flavor of the sea, was perfectly salted. Four dishes, plus house wine and mineral water came to €36. 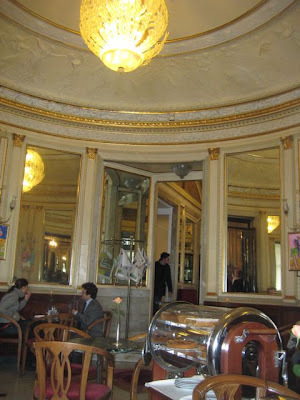 We also tried the touristy Gran Caffe Gambrinus. It has a lovely interior. But the expensive cappuccino was nothing special. 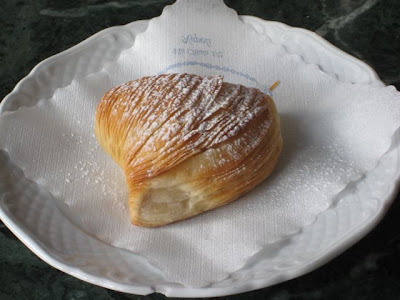 The sfogliatelle, a beautiful filo-like pastry stuffed with orange-flavored ricotta was not so fresh -- a little too chewy. We had a beer, two glasses of wine, a coffee, an orange sorbet, and the sfogliatelle and the bill was €35. 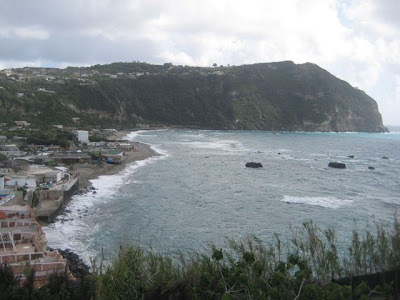 Finally, we took a ferry ride out to Ischia. It took an hour and cost €16 per person each way. 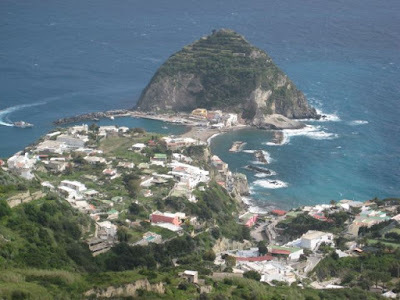 I rented a 125cc scooter (€30 for eight hours), put V on the back, and we circumnavigated the island. Apparently, according to EU law, you now need a proper motorcycle license to rent a bike like this. Which I don't have. But as V said, "It's Italy, baby. Anything is possible." And it was. I just had to convince the woman I knew what I was doing. Anyway, we stopped at a very nice beach in Forno, near the thermal baths on the side of the island opposite from the port. It's a place we'd like to return to someday. 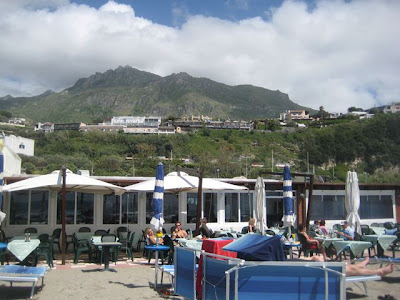 We had lunch at La Sirena del Mare. It looked like a simple beach restaurant, but the food was better than expected. 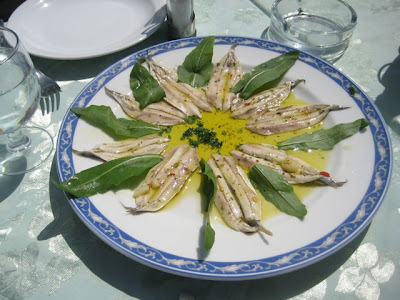 With the roaring sea in front of us, we had a very lemony plate of marinated anchovies (€7.50). 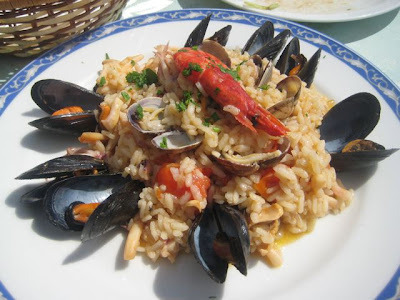 I had a seafood risotto (€11), which was basic and just OK, a little gritty. 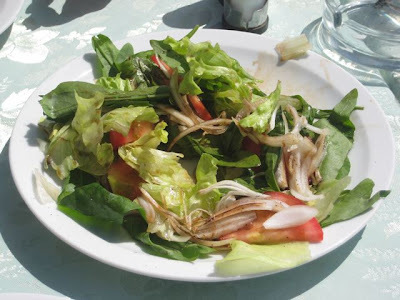 The mixed salad (€4) didn't look like much, but it had fantastic tomatoes. They had the perfume of a fully seasoned tomato sauce all by themselves. It's just so rare to find that in tomatoes elsewhere. 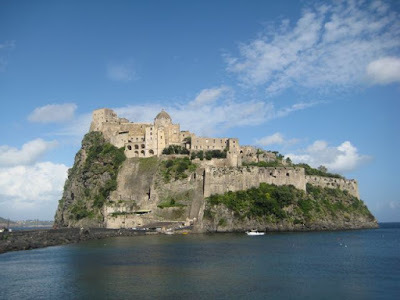 Near the end of the ride, we stopped at the Castello Aragonese. But they wanted €10 to go inside, so we just admired the outside. We also went to Capri. We enjoyed lying in the sun for a few hours on the stony beach at the harbor. But otherwise, it was way too touristy and crowded. 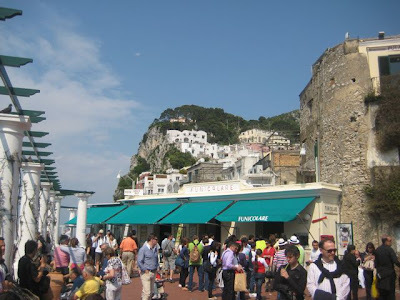 There were lines for boat tours, lines for the funicular up to the town, lines for the funicular tickets, and lines for gelato. We had a bad, overpriced, tourist-trap lunch. 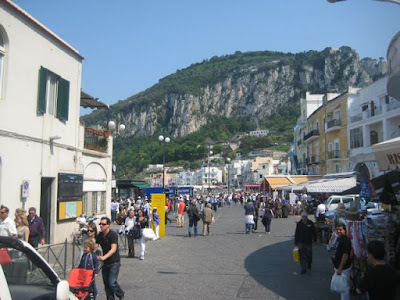 This was our second time on Capri, and we decided there was no need to return again. 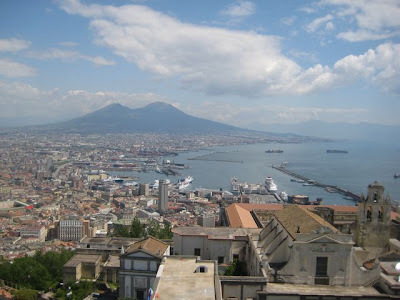 Would I recommend a visit to Naples? I don't know. It's not for everyone. There's a lot not to like. I'd just say that it is something of a fool's paradise. The stern fact is that you should expect the worst. But then you just might enjoy what's best. Thanks Brian. 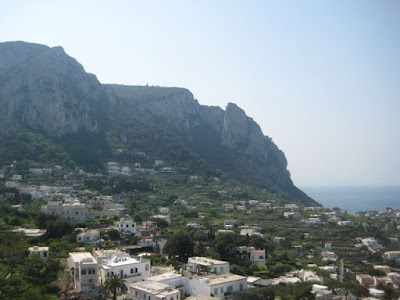 Actually did A couple of nights on Capri years ago and enjoyed it more. Ate much better, but still too touristy until most people went back to Naples for the day. 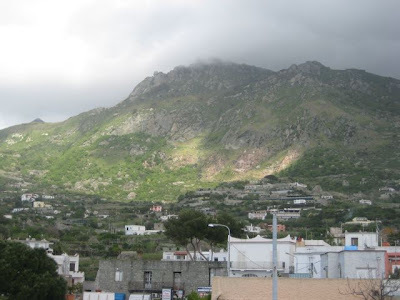 Went to Anicapri and the top of the mountain on the lift back then -- absolutely gorgeous up there.